Numerous factors make autumn and winter a dangerous time of year for contractors. Shorter days means less daylight to avoid hazards such as slippery fallen leaves, ice, and rainwater. Indeed, worker compensation claims shot up 14% during a bout of severe weather in January 2004, according to an OSHA article. For contractors, including demolition crews, continued productivity requires that special precautions be taken to prevent winter accidents. This blog covers how industrial demolition services can keep workers stay safe on construction sites this winter. Place absorbent mats and/or canopies at building entrances, to minimize slip hazard. Many falls take place here, where rainwater tends to pool. Also discourage workers from cutting across dirt, which will only exacerbate slickness. Or, if all of your workers tend to take the same shortcut, consider turning this into a proper path. Scatter salt in slip-prone areas. Monitor temperature and create a system for slip hazard reduction. For instance, a certain employee’s duties could include scattering salt when the temperature is forecasted to drop below freezing. Improve Worksite Lighting. Industrial demolition services should ask workers whether they can see what they’re doing on the job. If the consensus is that more lighting is needed, you can add new area lights, change out current bulbs for brighter models, and/or equip each worker with a headlamp. Clear Ice and Snow from Ladders, Scaffolding, and Boots. If possible, keep workers on the ground level during fridgid weather. If upper stories require work during wintery weather, be sure to have workers remove snow from rungs of ladders as well as boot bottoms before climbing up. Ensure Crew is Ready for Cold Weather. When you know extreme weather is coming, hold a meeting with workers ahead of time. Check that everyone has insulated, waterproof boots and clothing. Layers of wicking clothing are ideal for working in changeable weather. Train Employees on Wintertime Maladies, such as frostbite, hypothermia, and trenchfoot, which are hazards of any wintertime outdoor activities, including demolition. Portland rarely sees bitterly cold temperatures, yet workers should still be trained on how to recognize and respond to symptoms of trench foot and hypothermia. Because the latter condition is dependent on the body’s ability to maintain its core temperature, it’s still possible to suffer hypothermia when the weather isn’t extremely cold. 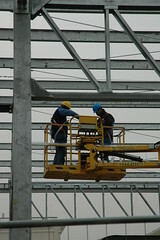 Finally, ensure that workers use the buddy system, so that help can be obtained right away if something should go wrong. With the right preparation, industrial demolition services can avoid costly wintertime workplace accidents. This entry was posted in Scrap Metal Demolition, Scrap Metal Recycling and tagged demolition portland, industrial demolition contractors, industrial demolition services. Bookmark the permalink.